This area this is located in is called the Snake River Plain, and it traces the path of the North American Plate over the Yellowstone hotspot, now centered in Yellowstone National Park. 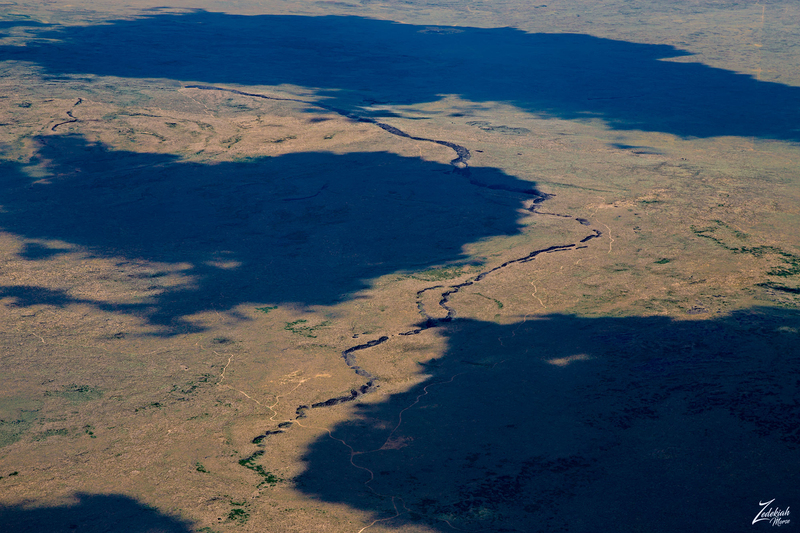 The eastern Snake River Plain, where this is located, is a topographic depression that cuts across Basin and Range mountain structures, more or less parallel to North American Plate motion. It is underlain almost entirely by basalt erupted from large shield volcanoes. Beneath the basalts are rhyolite lavas and ignimbrites that erupted as the lithosphere passed over the hotspot. And this is what has caused these formations to occur. 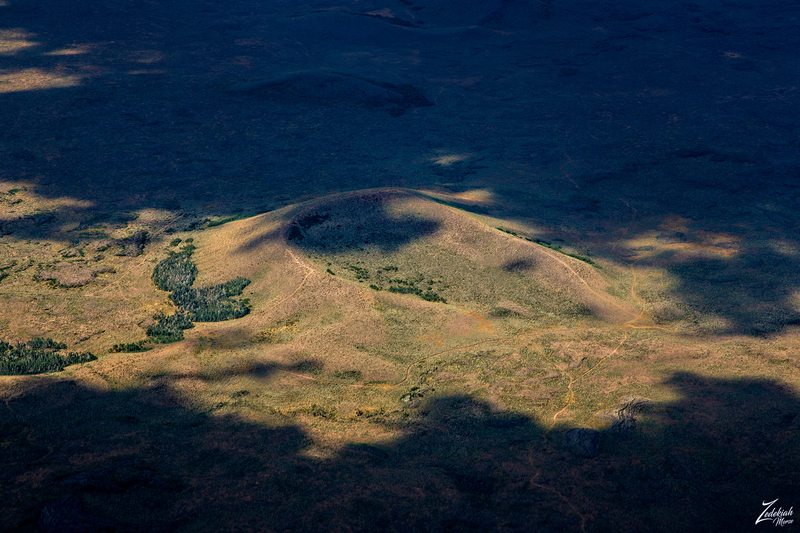 Black Knoll, shown in the image above, is a near perfect, classically shaped volcanic cinder pit. This ancient testament to millions of years of volcanic activity is one of a multitude of volcanic geology that dots the Snake River Plain. In the image below you can see how that certain parts of the formation are “contained”, in other words, there was some sort of “roof” or “ceiling” which created a covered surface across the formation, which, over time have begun to collapse. 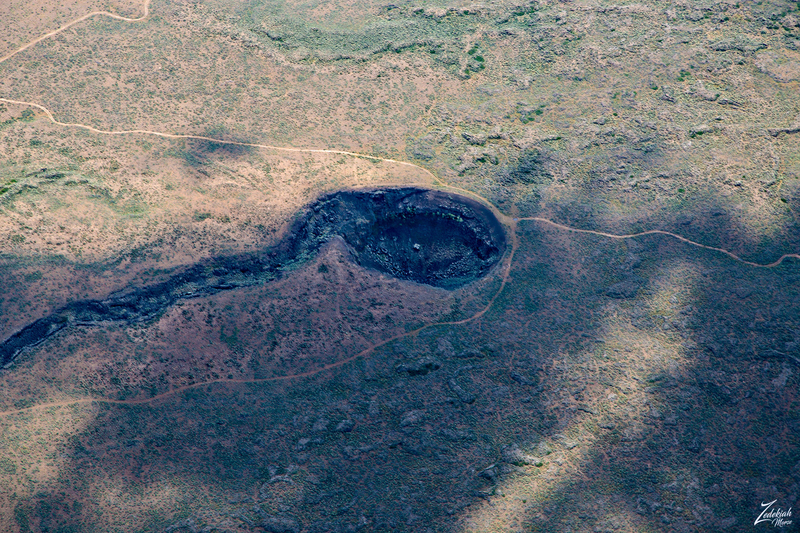 From above there was clearly a depression which was obviously an ancient volcanic lava tube that was eroding and becoming exposed from above. You can see where parts of the tube still have a surface cover. The adjacent depression was an indication of an effect of surface caving wherein the mass below this area was starting to give way to the weight of the material on the surface and was eventually going to fall into a large hole. You can see smaller holes already present next to the larger depression area. Following the exposed lava tube a few more miles, I came to its beginning. 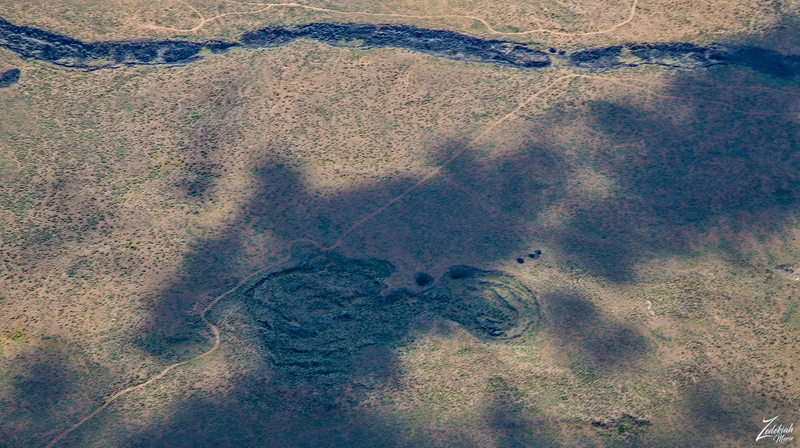 (Following photo) This is a very odd formation, first of all, it is unnamed, which in and of itself is very strange. I have looked high and low on topographical maps and have read through vulcanology journals to no avail. Also what I am unclear on is whether this is a volcanic “pit” or simply a collapsed volcanic cone. 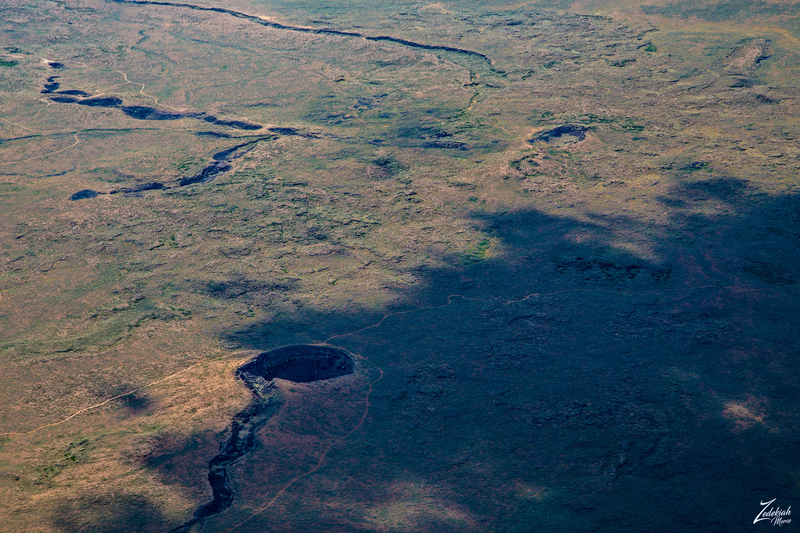 It could be either, but chances are it is the former, especially when you understand how horizontally inclined lava tubes are formed; Lava tubes are formed when molten lava flows steadily in a confined channel for many hours up to days. Over a short period of time, these superheated lava-flows will develop a solid crust which then forms a roof created when bits of lava stick together and then harden. If the molten lava stops rising from its source deep within the earth, then the lava stream that is moving inside of the now crusted-over tube, will drain away and in its place will leave an open, hollow lava tube cave that tuns the entire length of the lava flow, which can sometimes be many miles long. As in the case of this particular find. So what we are looking at here in this image is possibly the lava tube and original cinder cone that have both collapsed after the lava ran dry, leaving both the tube and this volcanic cinder pit. Whatever it is, it is very old. The last volcanic activity in this area was about 1.3 million years ago. And as you can see, even though the core of this ancient tube and pit are made of volcanic materials, there are plants growing in certain parts. Another interesting local phenomena are the ice caves located less than a half mile away from the cinder pit and lava tube. In the following photograph, if you look towards the top of the image you can see another exposed lava tube, similar to the one I was tracking. The exception is that this one has a large open exposed area which has, over time, become a locally well known Ice Cave. 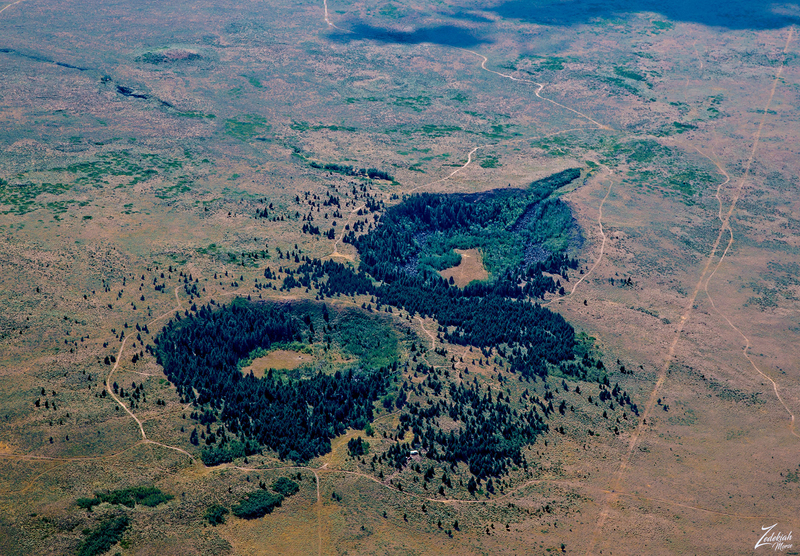 To the west of the ancient volcanic lava tubes, ice caves, and cinder pit there is a double collapsed cinder pit known as Pine Butte. This is about as close to a veritable oasis as you will find out here in the sagebrush prairie deserts of northeastern Idaho. Like the cinder pit above, this is an ancient volcano, albeit a double-coned volcano. But this is a very special place with its own unique forest-based micro-ecology. Looks like an interesting place to visit.